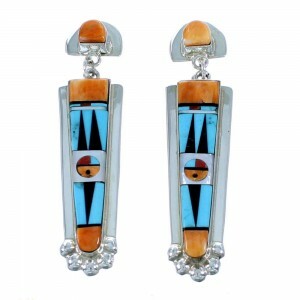 Among the most popular and versatile categories of earrings we offer, is our huge assortment of Native American earrings and Southwest multi-color earring jewelry styles. 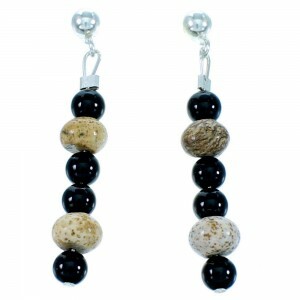 We have a massive collection in a huge spectrum of color combinations, inlay patterns, and stone types. 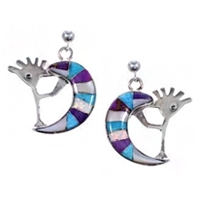 Our collection of multicolor earrings includes traditional handmade variety of multicolor earrings to make it easy to find the right item at an amazing price. 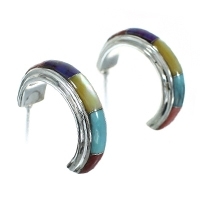 When it comes to multicolor earrings there are generally two different types, which include multi-color inlay earrings with different colors of stones set in sterling silver or 14k gold settings. 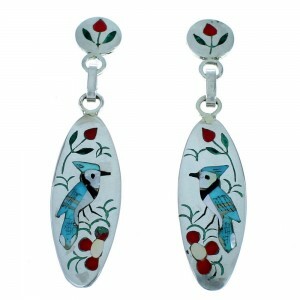 In jewelry, inlay is the process of cutting different stones like turquoise, coral, and malachite to fit together perfectly and make stunning patterns and designs. 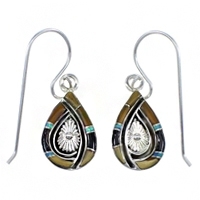 The inlay multicolor earring can be a real piece of art as members of several tribes have perfected the art of multicolor techniques and are able to create amazing pictures and designs using stone, shell and other items. 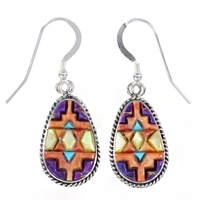 Our selection of multicolored earrings in inlay covers a broad spectrum of styles and price ranges. 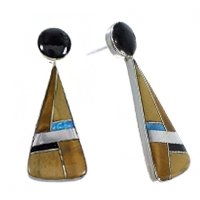 In addition to our extensive line of multi color inlay earrings we are proud to offer a stunning collection of multi-stone earrings that utilize many different stones in silver or gold settings to create a dazzling effect. 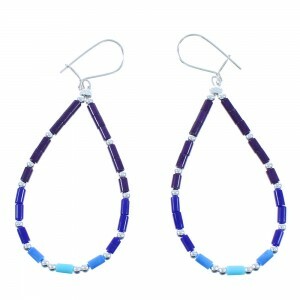 Our collection of multicolored earrings is huge and is always growing. 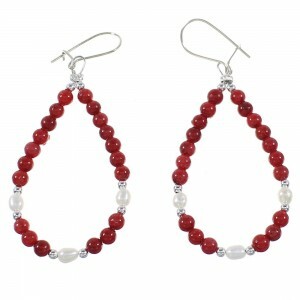 We offer a great selection of earrings that come with all sorts of different stones and in different arrangements and our hoop multi-color earrings are a classic that should be a part of any collection. 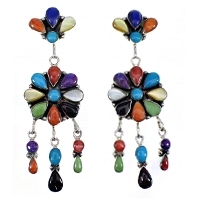 With all the multi-color earrings and we have available, you should have absolutely no problem finding exactly what you need. 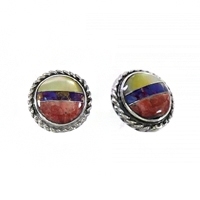 We carry so many different colors and stones that the perfect pair of multi-color earrings are just waiting here for you to discover them. 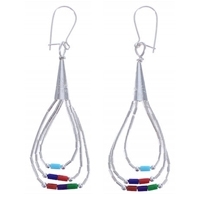 At SilverTribe it is our mission to be your number one source for the best multi-color earring styles available anywhere. 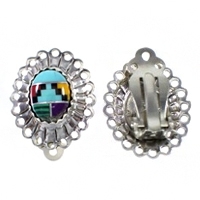 We work with some of the best artists in the world and use some of the highest quality materials to create multicolored earring masterpieces that are affordable and accessible to everyone, our prices are the best possible and our selection makes it a no brainer to shop at SilverTribe. 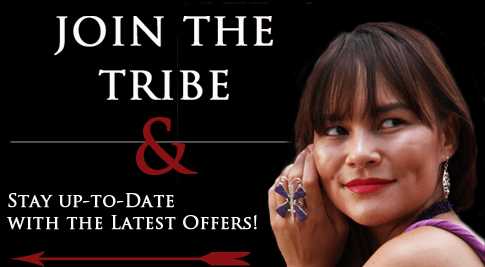 Explore our massive selection to find the right piece at the perfect price. We strive to provide the best value and craftsmanship the industry has to offer. 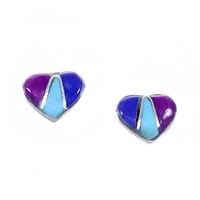 See for yourself why we are the online leader in authentic multicolor earring designs.